PLM Prompt: Should PLM think about Google Apps? 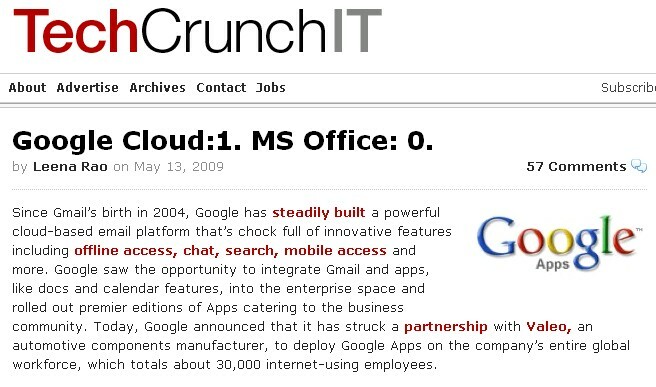 Look at this news about Google Cloud: 1. MS Office: 0. Actually, most of the discussion here is about when MS Office will die, but for the PLM minded reader I’d say – look at the customer. Automotive Supplier Valeo is on the list of PLM businesses. So, let’s discuss – where does PLM cross its path with Google Apps on a Cloud? Given that Excel is the mostly widely used PLM tool (for BOM management), I think Google App’s is a worthy successor. For companies that don’t want to, or can’t afford, a full PLM tool Using Google APps is a great way to take the spreadsheet model and extend it to work teams and beyond company boundaries. Also, I think Google offers the ability to “open source” widgets and extensions, which might allow for a real open source development of light-weight PLM. I think the down-side is that Google hasn’t yet earned the credibility of enterprise users and hasn’t proven they can really manage data security and integrity (they have had some failures in this regard). If they stick to it, they have enough capital and smart people to overcome these barriers. on a personal level, I’ve already completely moved over to google apps. ya know what else? people I know that are not so computer/excel/word processor savvy are finding it easier to use. think about that one. Really though, what’s beyond this for PLM? We’ll begin to migrate to online apps. new businesses will find it more cost effective. how about web-based ERP systems that integrate with G apps? Cost reduction and analysis apps for stimulating business growth? There’s lots more potential that just using the cloud for storage of BOM’s. Let grab that data, mix it with engineering and production and see what happens. Feeling like I am the choppy kid trying to catch up to the other runners in grasping this whole “cloud” thing. How far are we from this in your opinion, I still receive prints from major companies in the “Valeo league” over the fax for quoting, “Prints” “Fax” sound very old fashion when talking cloud. Josh, thanks! You raised valid point – what PLM will get from adoption of Google Apps and infrastructure. I see lots of undiscovered – storage, simple apps, availability, etc. The most important feedback for me is your personal use. You (as designer) are ready!… -Oleg. Lars, thanks for joining conversation. I think Kate provided best answer. Dinosaurs will co-exist some time… Just need to disconnect from them. Otherwise we know what happened to them dinosaurs ;)… Thanks for your comments and welcome to plmtwine discussion!. Oleg. Kate, fax is answer on “concerns” people still have with regards to online/cloud and other apps. Actually people already have no concern to office apps (like if you have USB stick and MS Excel, you are 100% safe). With online/cloud and other apps, this is still not true. Therefore people are printing reports and sending order by fax. I think in French hotels this is also liability concern related to existence of order. Will be glad to see results of you “cloud concern” vote. Best- Oleg. I think technologies have long tails (see vacuum tubes). Having consulted with some traditional providers and customers, there is a segment of the market that will be a long time off in transitioning, and some that may “never” (see companies with ITAR requirements). Therefore, I think major vendors need to embrace the reality of the hybrid (some cloud/some on premise) and think about how to get the best of both worlds. I think this is the realistic long term path. Mark, thanks, this is probably good trade-off. Acceptance of cloud-based solutions will grow because it will become cheaper and cheaper. I will give you an example. Your gmail is bigger by size compared to any corporate mail box. This is impact of cost in my view. I agree that the majority of applications will head toward cloud over some time horizon (I would say more like 10+ years). I’m not sure that cost is the only driver for selection — reliability, security, and quality of solution will matter much more for some markets and will keep them right on the ground and out of the clouds. Security is important concern for most of enterprise apps today. When I’m talking about cost I mean combined cost – IT, installations, upgrades… Take for example Gmail off-line solution. Can you get something similar today for enterprise web deployments?